Jackson Design and Remodeling is proud to share with you here some of the recognition we have received for award-winning home design, along with awards for our entrepreneurial spirit, service to the community and ethical business practices. In 2018, Jackson Design and Remodeling ranked #16 in the nation on the Remodeling 550 list of full service remodelers. Remodeling Magazine’s Remodeling 550 is a list of the nation’s largest residential renovation companies. It comprises four categories: full service, specialty and replacement, insurance restoration companies and franchise operations. The rankings are based on CPA certified statements on annual sales volume. 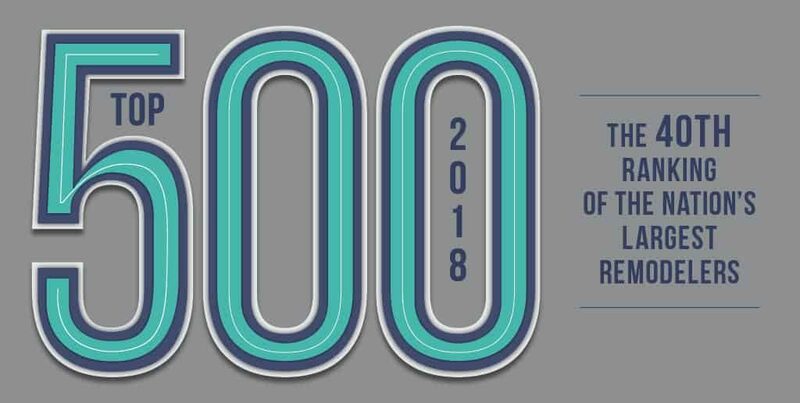 Jackson Design and Remodeling is proud to rank on the 2018 Inc. 5000 list. Jackson Design and Remodeling is included on the prestigious honor roll and has been on the Inc. 5000 nine times. Just 1% of all companies nationwide have made the Inc. 5000 nine times. In 2018, Jackson Design and Remodeling ranked #69 out of 500 of the Top Remodelers in the Country based on volume of work, according to Qualified Remodeler’s Top 500 list. Jackson Design and Remodeling has been ranked on the Qualified Remodelers’ prestigious Top 500 list every year since 2004. The Top 500 list recognizes remodeling firms for significant and sustained success in the industry for the following six criteria: annual sales volume for the previous year, total number of years in business, association membership, certified employees on staff, industry awards and community service. It is the longest running ongoing recognition program in the remodeling industry. Jackson Design and Remodeling was named one of the 100 Fastest Growing Privately Held Companies in 2018 and in 2007, 2008, 2009, 2012, 2013, 2014, 2016 and 2017. This list represents the best and brightest privately-owned businesses in San Diego, reflecting the tenacity and business acumen of companies that have shown consistent financial growth. Design Department Manager and Senior Designer Tatiana Machado-Rosas was selected in 2017 as a “Design Industry Innovator,” one of the “KBDN 50,” a selection of the country’s Top 50 design industry innovators by Kitchen & Bath Design News. Tatiana was honored for her leadership and dedication to mentoring upcoming designers, as well as her influence on design trends. The KBDN 50 award recognizes those whose work, creative talents, business acumen and professionalism are leading the way for the industry and elevating the kitchen and bath trade. Winners are nominated by their peers and then chosen by the KBDN nomination committee. 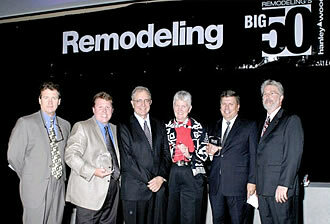 REMODELING magazine’s coveted Big50 award is presented annually to the nation’s top 50 remodeling companies. Recipients of the Big50 award set the industry standard for professionalism and integrity and are recognized for smart marketing, exemplary business practices, unique designs, and extraordinary impact on their communities and the industry at large. Jackson Design and Remodeling was one of only nine remodelers in the country to receive the prestigious 2015 Market Leader designation from Professional Remodeler magazine. We were honored in the Fine Design category and recognized for our efficiency and design-centric operation. Professional Remodeler named Jackson Design and Remodeling as a Market Leader in San Diego, California for six consecutive years. The Market Leaders program recognizes the top five revenue producing remodeling firms in 20 of the country’s top markets. Jackson Design and Remodeling, Inc.
Jackson Design & Remodeling is proud to announce that Todd Jackson has been honored as one of four finalists for the national 2009 Fred Case Remodeling Entrepreneur of the Year Award, considered by many to be the most prestigious award in the remodeling industry. The winners were chosen by a panel of judges representing Case Design/Remodeling, Inc., Hanley-Wood and Harvard University’s Joint Center for Housing Studies. The Fred Case Remodeling Entrepreneur of the Year Award was created to honor and recognize the entrepreneurial spirit of remodelers and the importance of creativity and innovation to the industry. All four finalists were acknowledged at a celebratory awards dinner in Washington D.C. at the Big50 gala dinner at the Remodeling Leadership Conference. Todd Jackson was honored as one of four finalists for the national 2009 Fred Case Remodeling Entrepreneur of the Year Award, considered by many to be the most prestigious award in the remodeling industry. In 2007, Todd Jackson won the SD Metropolitan Magazine’s 40 Under 40 award, which recognizes 40 people under 40 years old for their outstanding contributions to their communities through their jobs, community work, volunteerism and leadership. Senior Designer Tatiana Machado-Rosas was named “Design Team Innovator” by San Diego Metropolitan in the Class of 2010, the 11th annual 40 Under 40.